Ireland must chase World Cup glory without talismanic captain Paul O’Connell, and potentially Johnny Sexton, Sean O’Brien and Peter O’Mahony, as their seismic 24-9 victory over France comes at a huge cost. O’Connell’s Test career looks over after 108 caps, the Toulon-bound lock punching the turf in agony with a serious leg injury as Ireland set up a quarter-final with Argentina. 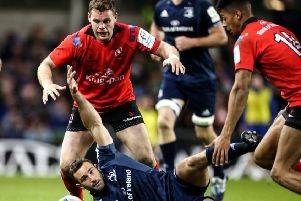 Linchpin fly-half Sexton trudged out with a groin strain and nursing sore ribs from a hefty hit from Louis Picamoles, while Sean O’Brien could face a citing for an alleged punch on Pascal Pape. Combative flanker O’Mahony departed via a stretcher with a suspected knee problem amid the second-half maelstrom, as the toll of a searing contest grew and grew. Ireland will now meet the Pumas in the last eight, avoiding defending-champions New Zealand and lining up their best-ever crack at a first World Cup semi-final. Totemic lock O’Connell will retire from Test rugby at the end of Ireland’s World Cup campaign, but will surely now miss the rest of the tournament. Rob Kearney and Conor Murray claimed the tries to subdue a stunned France, whose pre-match fighting talk evaporated under real pressure. That Ireland were able to fend off France without four crucial stars for the majority of the clash can only be testament to the work of shrewd Kiwi boss Joe Schmidt. Madigan stepped out of Sexton’s shadow in fine style too, bossing Ireland’s line with poise and authority, while O’Brien and Robbie Henshaw turned in performances critical to this win. Ireland’s retribution for Pape’s cheap-shot knee to Jamie Heaslip in the Six Nations was for O’Brien to smash the Stade Francais lock square in the ribs. Irrespective of whether the citing commissioners review the incident, O’Brien set Ireland’s tone, with Pape prone on the turf for several minutes.